How to protect your Facebook account from Facebook hackers? These questions have never come into your mind at all. So let's know about some such settings of Facebook today. With the help of which you can keep your Facebook account safe from Facebook hackers. So you will get all the information about these settings, such as- These settings will be found on the inside of Facebook and how you can start these settings and what settings are used. 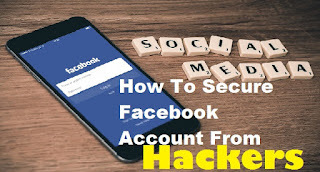 All these information is given to you to protect your Facebook account from Facebook hackers, then read all the information carefully and then use them only. How to increase the security of the Facebook account? All the above options will be available to you under Security and Login Options. Now let us know about all these options one by one. What is the option of which option and how to get started? With this option, you can find out when your Facebook account, when asked, in which device, which browser, which application is logged in and which mobile phone is logged in. You can find all these information from this option. At the same time, you can also find out that your Facebook account is active but that is the login. And if you feel that someone else is using or is using your account, then you can log out of it with this option. Or you want your Facebook account even logged in where it is logged from all the locations and all the devices, then you will find the "see more" written at the bottom of this option. Then you will get another option named "Log Out Of All Sessions" on the lower side and click the tax. "Log Out Of All Sessions"
(a) Change password- With this option, you can change the password of your Facebook account. To change the password, you must first enter your existing password and then enter your new password. So in this way you can change your Facebook password. 1. Use password- After launching this option, whenever you click on your profile picture on Facebook's login page, you will be asked to enter your Facebook account password every time. 2. Remember password - After launching this option, whenever you click on your profile picture on Facebook's login page, you will not be asked for your Facebook account password. Your account will be opened once you click on the profile picture. (a) Use two-factor authentication- This option is the best and most needed option for the security of your Facebook account. After starting this option, whenever you If your Facebook account is logged in to a new device, a password will be sent to your mobile number via SMS. After entering that password, you will be able to login to your Facebook account. In this way, no one else will be able to login to your Facebook account. Unless he has a password sent on your mobile phone. Keep in mind that these passwords will be sent to your mobile number which you have given in your Facebook account. (b) Authorized Logins- After starting the "Two-Factor Authentication" option, you can find out that the use of "Two-Factor Authentication" in your Facebook account, and which app and which device to login Time has been done. Together with this option, you can also make sure that in which app or which device "Two-Factor Authentication"
(c) App passwords - By using this option you can create a special password for some app. After starting the "Two-Factor Authentication" option, whenever you log in to Facebook in a new app, a password will be sent to your mobile. But there are some apps that do not send passwords on your mobile, this special password is created for this type of app so that you can log in with Facebook in those apps by using this space password. If you want to make your Facebook account even more secure, you can use both options given in this option. (a) Get alerts about unrecognized logins- After using this option, whenever someone logs in to your Facebook account with a new browser or any new app or new mobile, you will be notified by sending Notifications, Message, and Email... And as soon as you get to know more about your Facebook account and log in, you can log out your account from that device using the "Where You're Logged In" option and after logout you can log out By changing the password you can avoid misusing your Facebook account. (b) Choose 3 to 5 friends to contact if you get locked out- This option comes in handy when your Facebook account is locked. When you start this option, you will be asked to select 3 to 5 friends from your friend's list. You can start this option by selecting any 3 to 5 friends from your friends' list. After that, whenever your account is locked, you will be asked about the same 3 to 5 friends selected for you to start your account again. If you choose your chosen right friend, your account will be restarted again. So in this way you can use these options to secure your Facebook account and save you from hacking. If you liked the information given above, please follow my Google+ Account and if you have any questions or suggestions, please comment below.